Based on true events where by Martin Sixsmith, ex BBC journalist, is approached by the daughter of Philomena to find her long lost son. Philomena’s child was taken from her by nuns and adopted by Americans in 1955. Sixsmith and Philomena find out what happened to her son and learn that he visited Ireland. Sixsmith gets past the secretiveness of the nuns to a showdown. Happily there is closure. 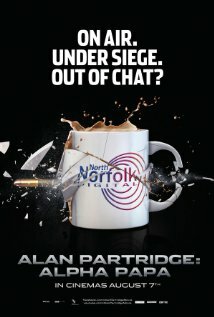 Partly produced by Steve Coogan, this film has a great emotional pull on us. 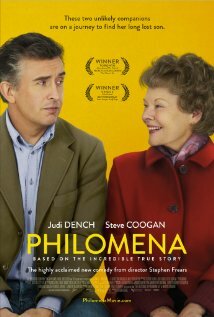 The relationship between Judi Dench as Philomena and Steve Coogan as Sixsmith is an encounter between two cultures as they learn about each other. Sixsmith comes from the Oxbridge elite, all liberal secular values, journalistic cynicism, aquaintance with ‘spin’ (or fancy lying), and the journalistic jet set. Philomena started as an unsophisticated Irish girl victimized by the ferociously repressive regime seen in Magdeline Laundries. These were, in effect, gulags for young women who fell foul of rigid Catholic morality. Sixsmith is all easy cosmopolitan quips, his body language is that of the successful investigator pretty well up on the tricks and foibles of those he’s investigating. The world to him is a newsroom and he seems to own it. Philomena is working class and unapologetic about her poor education, turning this drawback into the unruffled virtues of Christian decency. As Sixsmith can’t penetrate this armour, he’s reduced to mild sarcasm and quick judgementalism. Philomena has an instinct for the proud and cynical, the mutual incomprehension livening their culture class comedy routine. Critics are keen on saying that films like this are moving because there’s some emotional charge between the characters, as if that should be a surprise. Perhaps it’s because such critics adhere to the myth of journalistic detachment. As in the film Magdaline Laundries we are made to focus on the worst that some of these nuns did. One sister simply echoes Mother Theresa’s refusal of medical treatment to her charges, on the grounds that it “would delay their journey to heaven”. Interestingly the film exposes our double standards over tolerance of religious intolerance, it’s easy for us to expose the crimes committed by Christians but we seem reluctant to expose even worse abuses (such as infibulation) which take place under the auspices of other cultures and religions. Sixsmith also enjoys the luxury of vicariousness as he’s unforgiving of the nuns whereas Philomena isn’t. Judi Dench is the real anchor of the film, she brings that same impressive presence she can use as a bad person in Notes on a Scandal and as James Bond’s boss. When she is impressed by the privileges and people Sixsmith knows she summons a life of quiet patience and decency. When Sixsmith tells her that he briefly met her son I wondered if he could end up being a sort of surrogate son for her. Sometimes nearly unwatchable as a film about loss and love.